As the gap continues to widen between the haves and the have-nots, I find it incredibly comforting to know that for just a bit more than it costs me to rent my home each month, the top 1% of our population can have access to a credit card they could use to purchase my entire county of residence. 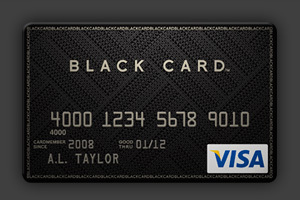 That's right, for the paltry price of just $495 per month annually, the Barclay's Visa Black Card is ready and waiting to serve the uber-wealthy. It's just too bad that the card probably isn't available to anyone who will read this. The ultra exclusive Black Card is produced in stunning black carbon graphite, making it the most durable fake money around. In addition to having possibly the most exclusive credit purchasing weapon on the planet, card members are provided with 24 hour, top of the line, concierge service. I can just see myself calling for my personal chauffeur now, "Have James bring the pick-up truck around from the wood pile, won't you?" In addition to the Black Card's exclusivity, durability and obvious assignment of class status, card members are promised gifts from top brand names and unhindered entrance to airport VIP lounges across the planet. Black Card ownership puts the world at your finger tips, offering assistance in finding anything from regional language translators to tailors, doll makers, and party clowns. So, if you're a five time winner of your state lottery jackpot, or if you're just an investment banker with impeccable timing and an itch to spend your last three years of multi-million dollar bonuses, take heart, because there's a credit card made especially for the CEO of a failed multi-billion dollar corporation or a mortgage industry crook. It's called the Visa Black Card, it's issued by Barclay's Bank Delaware, and it will take you to anywhere that the rest of us can't go.